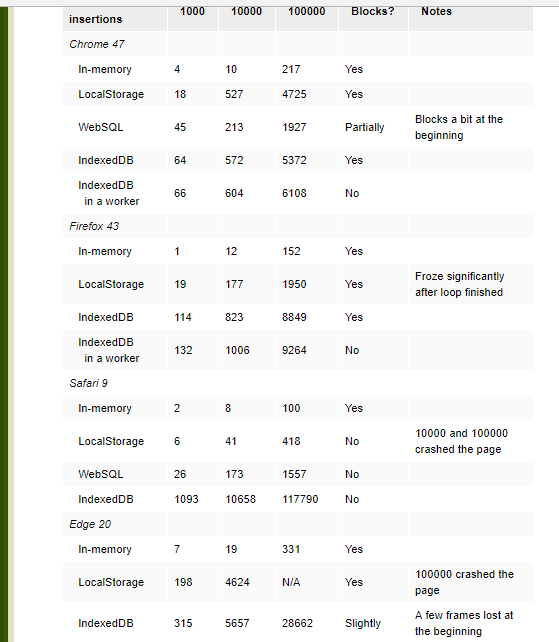 How is indexedDB conceptually different from HTML5 local storage? Both indexedDB and local storage are key value stores. What is the advantage of having two key/value stores? indexedDB is asynchronous, but joins (the most time-consuming thing) are manual. They appear to run in the same thread as the async calls were made. How will this not block the UI? indexedDB allows a larger store. Why not increase the size of the HTML5 store? I'm scratching my head. What is the point of indexedDB? This is fine if you only have one, or a few objects, in local storage. But imagine you have a thousand objects, all of which have a property b, and you want to do something just with those ones where b==2. With local storage you'll have to loop through the entire store and check b on each item, which is a lot of wasted processing. With IndexedDB you can store stuff other than strings in the value: "This includes simple types such as DOMString and Date as well as Object and Array instances." Not only that, but you can create indexes on properties of the objects that you stored in the value. So with IndexedDb you can put those same thousand objects in it but create an index on the b property and use that to just retrieve the objects where b==2 without the overhead of scanning every object in the store. At least that's the idea. The IndexedDB API isn't very intuitive. They appear to run in the same thread as the async calls were made. How will this not block the UI? Because, without proper indexing, it would get increasingly slower the larger it got. Adding to the anwser of robertc, indexedDB knows 'ranges' so you can search and retrieve all records that start with 'ab' and end with abd' to find 'abc' etc. I came across this good article discussing about localstorage vs indexeddb and other possible options. Not surprisingly, since any synchronous code is blocking, in-memory operations are also blocking. The DOM blocks during long-running inserts, but unless you’re dealing with a lot of data, you’re unlikely to notice, because in-memory operations are really fast. IndexedDB works swimmingly well in a web worker, where it runs at roughly the same speed but without blocking the DOM. The only exception is Safari, which doesn’t support IndexedDB inside a worker, but still it doesnt block the UI. How to get along with HTML5 offline apps when the WebSQL is deprecated? HTML5 persistant storage: Local Storage or SQLite?